Vice Admiral Griggs was born in Homebush NSW in 1961. He joined the Adelaide Port Division of the Royal Australian Navy Reserve in 1978 as a radio operator and entered the Royal Australian Naval College at HMAS Creswell on a short service commission in 1979. He was appointed Vice Chief of the Defence Force on 30 June 2014. During his seaman officer training Vice Admiral Griggs served in the aircraft carrier HMAS Melbourne and HMA ships Yarra and Advance before spending 12 months loaned to the Royal Navy in HMS Jersey to gain his Bridge Watchkeeping Certificate. In late 1981 he was posted to HMAS Perth as a Bridge Watchkeeper and deployed to the North West Indian Ocean in support of Australia's independent presence in that region following the Soviet invasion of Afghanistan. From 1983 to 1994 the then Lieutenant Griggs completed a series of postings as Navigating Officer of HMA Ships Cessnock, Torrens, Tobruk, Jervis Bay and Perth. Ashore he has served in variety of roles including as the Aide-de-camp to His Excellency the Governor of Tasmania, Sir James Plimsoll, AC, CBE, two postings in the Navy's officer career management directorate, Staff Officer (Navigation) to the Commander Australian Patrol Boat Forces and as Deputy Director Military Strategy and Director Future Warfare in the Australian Defence Headquarters. He completed specialist navigation training and graduated as a Principal Warfare Officer. Between 1995 and 1997 Vice Admiral Griggs served as commissioning Executive Officer of HMAS Anzac helping to bring the Anzac class into service. In October 2001 he assumed command of the Anzac Class frigate HMAS Arunta and was immediately involved in border protection duties as part of Operation RELEX. Arunta then deployed to the Persian Gulf to enforce United Nations sanctions against Iraq and in support of the War on Terror. The ship was recognised for her efforts by being awarded the Duke of Gloucester's Cup for being the most operationally efficient ship in the RAN fleet for 2002. In 2003 he was posted as the Anzac class Capability Element Manager in Rockingham, Western Australia. In 2004 he studied at the National War College in Washington DC prior to assuming command of the Australian Amphibious Task Group in mid-2005. 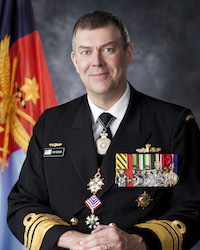 He was promoted to Commodore in February 2006 and appointed as the Deputy Maritime (Fleet) Commander until assuming the position of Director General Navy Strategic Policy and Futures in Navy Headquarters in September 2007. In February 2008 he was seconded to the Defence White Paper team where he led the development of the Force Structure Review that provided the force structure underpinning the 2009 White Paper. In early 2009 he attended the UK Higher Command and Staff Course and was subsequently promoted to Rear Admiral and appointed as Deputy Head Strategic Reform and Governance. In May 2010 he was posted as Deputy Chief of Joint Operations during a high tempo period of operations abroad and at home. He then went on to command of the Royal Australian Navy from June 2011 until June 2014. Vice Admiral Griggs was awarded the Conspicuous Service Cross in 1997, a Commendation for Distinguished Service in 2003 for his work in the Persian Gulf and appointed as a Member of the Order of Australia in 2009. He was made an Officer of the Order of Australia in 2012. He holds a Bachelor of Arts degree from the University of Queensland, a Master of Business Administration from the National Graduate School of Management at the Australian National University and a Master of Science (National Security Strategy) from the National Defense University in Washington DC. Public speeches given by former Chief Of Navy Vice Admiral Griggs are available in PDF format. High resolution imagery of Vice Admiral Grigg's official portrait is available to download from the Royal Australian Navy Media Library.